KT1 is a fully ergonomic under-desk computer keyboard tray. We designed the KT1 Ergonomic Keyboard Tray to include the ergonomic features and simple adjustability you need for optimal typing comfort – Raise, Tilt, Swivel & Slide keyboards to the perfect position. KT1 Ergonomic Keyboard Tray is adjustable in angle, letting you type with a neutral or negative tilt, and height (from about 4.5” below to desk level). It’s easy to adjust KT1 Keyboard Tray via the single locking lever (locking tension is adjustable). KT1 Ergonomic Keyboard Tray slides completely under your desk and swivels 360. KT1 Ergonomic Keyboard Tray’s mouse pad is independently adjustable in angle, which allows your mouse to be level even if you’re typing with a negative tilt. The ambidextrous mouse pad connects to either the right or left side and the distance between the mouse panel and keyboard panel is adjustable to optimize shoulder. KT1 Ergonomic Keyboard Tray comes with a premium mouse pad to ensure your mouse runs smoothly and non-skid strips on the keyboard panel to hold keyboards in place if you’re typing with a negative tilt. 1. ADJUSTABLE HEIGHT: from 4.5 in. below your desk to desk level. 2. ADJUSTABLE TYPING ANGLE: Promote wrist health by typing with a neutral or negative tilt. Non-skid grips keep your keyboard in place! 4. SLIDES UNDER YOUR DESK: Smoothly slides in and out and tucks completely under your desk. 1. Keyboard Panel Dimensions: 18.5 x 8.75""
KT1 is completely adjustable & allows you to properly position keyboards at a comfortable height & angle! 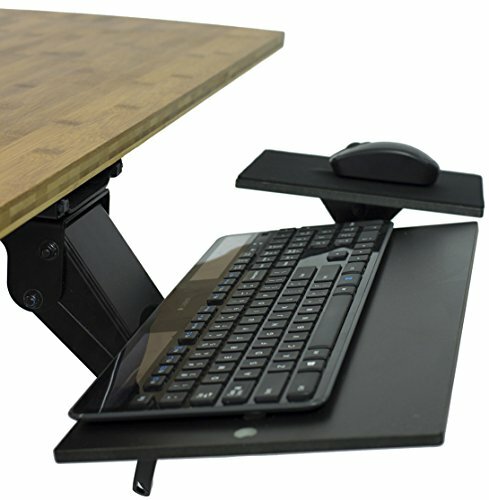 ADJUSTABLE TILT KEYBOARD TRAY: the KT1 ergonomic under-desk computer keyboard holder lets you quickly adjust your typing angle for a neutral or negative tilt to promote wrist health.